Published on Wednesday 3. June, 2009 in Events, Trips, Us and Vacations. 0 Comments Tags: Corsica, Mediterranean Sea. We met Sarah and Christian after they had had some hard days and spent a good time. Later this year Christian became Leonas designated godfather. 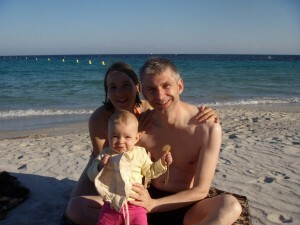 You are currently browsing the The world & us weblog archives for 'corsica' tag.